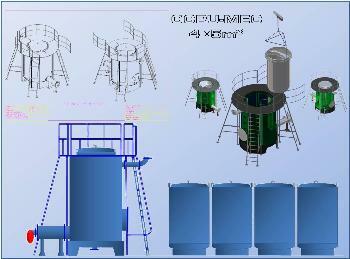 Continuous Charcoal Production Minar Engineering Co. innovated of the "continuous charcoal production unit" (CCPU) . This new system is a modification of the charcoal production kilns allowing much higher production rate and making efficient utilization of the generated heat leading to big reduction in the operation cost. The carbonization container became vertical in the new system to allow easy in & out of the carbonization container using moving overhead crane. Removed carbonization containers are placed on open air for much quicker cooling. These brackets can be tilted to charge raw material and discharge charcoal . The system comprises normally 4 carbonization containers. Upper walking plat form; on the same level as the upper part of the CCPU ; having protecting fence and connected to a ladder is used to hawk – up the carbonization container to the overhead crane after full carbonization to be let down on the carrying bracket for cooling down by natural air , leading to a big reduction in cooling down time .